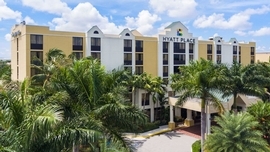 Our Park Snooze and Fly Package includes 1 week of free parking at the hotel near Fort Lauderdale - Hollywood International Airport while you're enjoying vacation and a one night's stay at Hyatt Place 17th Street Convention Center the night before your flight. Alternatively, we can provide hotel accommodations on the night of your return. Lastly, shuttle transfers will be provided to Fort Lauderdale - Hollywood International Airport when you depart and transfer you back to Hyatt Place 17th Street Convention Center upon your return so you may get your vehicle. If you have a late landing, staying the night of your return is also an option. You can take advantage of parking your car at the hotel prior to your flight and getting well rested at the hotel the night of your return. Our Park Snooze and Fly Packages are an excellent way to make airport parking convenient and affordable. 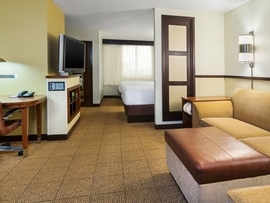 The Hyatt Place 17th Street Convention Center allows late arrival check-in so you know your room will be ready even if you have a late landing. The Hyatt Place 17th Street Convention Center, will allow you to extend your parking duration by booking a room on the outbound and return of your trip. If you need more parking than the included free parking at the Hyatt Place 17th Street Convention Center, you may extend the parking duration for an additional fee of (5.00 Per Additional Day) paid to the hotel. Transfer Note: Hotel charges $2.00 per room for airport shuttle. Fee is payable to hotel at check-in. Transfer Note: Transfers to pier are included for up to two people per room. 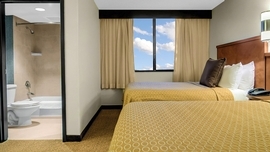 Additional persons are approximately $7.00 per person, payable to hotel at check-in. Hotel does not provide transfer service from the pier to the hotel or from the pier to the airport. Coffee - Yes - Located in the lobby.